According to HSE, skin disorders affect 40% of workers at some point in their career. Occupational skin disorders (OSDs) are amongst the most significant health and safety issues facing industry leaders across the world. Despite this, industry culture in the UK is such that incidents often go unreported and the threat remains largely unchallenged. This whitepaper from Deb puts occupational skin disorders (OSDs) in the spotlight, highlighting the prevailing issues facing workers and industry. 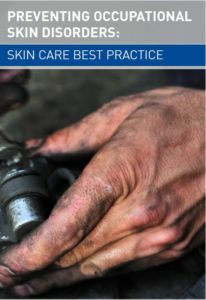 With contributions from leading industry experts, and workers who have been affected by an OSD, the whitepaper showcases the seriousness of the issue, and offers guidance on how employers can take control through a preventative skin care programme, incorporating a new best practice standard. The solution making skin health a priority for all with DebSafe. To download this whitepaper, simply fill out the form opposite. Preventing occupational skin disorders: skin care best practice According to HSE, skin disorders affect 40% of workers at some point in their career. Occupational skin disorders (OSDs) are amongst the most significant health and safety issues facing industry leaders across the world. This whitepaper from Deb puts OSDs in the spotlight.